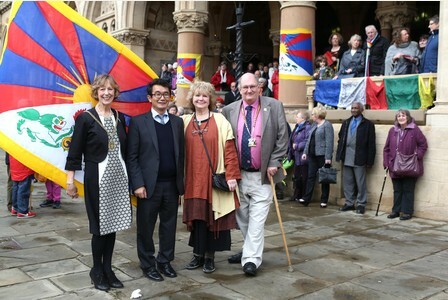 (TibetanReview.net, Mar04’16) – Ahead of commemorations marking the 57th anniversary of the Tibetan National Uprising Day on Mar 10, the Tibetan flag was raised in front of the guildhall in Northampton, United Kingdom, on Mar 1. Mr Chonpel Tsering, Representative of His Holiness the Dalai Lama, raised the flag, watched by Mayor John Caswell and Mayoress Cheryl Caswell during the hour-long ceremony. This has been an annual event in the town over the last 17 years, organised by a woman named Caroline Scattergood. More than 150 people watched the flag raising event, said the exile Tibetan administration at Dharamshala, India, on its Tibet.net website Mar 2. The flag raising action concluded the ceremony during which a four-minute documentary film highlighting the Tibet issue was screened with the playing of ‘No Matter What’ by Boyzone, which includes the lyrics ‘and I will keep you safe and strong, sheltered from the storm’.